This was a sponsored post for Philadelphia cream cheese that originally appeared on my review blog. All opinions are my own. In honor of the Real Women of Philadelphia cooking video competition, I decided to test out a recipe by one of the finalists. These Coconut Shrimp Poppers with Chili Mango Cream by finalist Carmell Childs sounded so good, I just had to give them a try. What I really liked about these fried shrimp was that they weren’t overly sweet like a lot of the Coconut Shrimp you find at restaurants. The shrimp were a perfect balance of savory and sweet and I loved the combination of chili and mango in the creamy dipping sauce. These were a huge hit with Phil—I’m glad I grabbed one right away, because once I turned my back they were gone. I had halved the recipe since there were only two of us, but next time I’ll be making a full batch for sure! 1. Peel and dice mango into chunks; combine with pineapple ring and puree in blender until smooth. In a medium bowl combine 4 oz. Philadelphia Cream Cheese and fruit puree. With a mixer on high speed, beat until thoroughly combined. Add desired amount of chili sauce; mix to combine and chill. 2. Rinse and pat dry shrimp. Pour flour in a deep bowl and season with 1/2 tsp salt and a few twist of ground pepper. In a separate deep bowl, combine 2 oz. Philadelphia Cream Cheese, eggs, and lemon zest; mix until incorporated. In a third deep bowl mix together Panko crumbs and coconut. 3. Toss shrimp in flour; shaking off excess, dip in egg, then lightly press and cover entire shrimps in coconut mixture; set aside on large platter. 4. In a deep saucepan, heat 2 in. of oil to 350*. 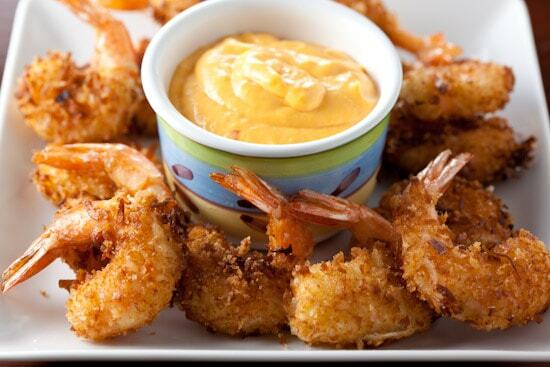 Fry shrimp, 4-5 at a time, for 1/2-1 minute or until golden brown. Place on a paper towel-lined plate and immediately sprinkle with sea salt to taste. Serve warm with chili mango Cream. Enjoy! Nicole's notes: I used regular, softened Philadelphia cream cheese, not the whipped kind. I used a mini food processor to puree the fruit and cream cheese for the dipping sauce. Make sure the cream cheese and eggs are at room temperature before mixing them together for the shrimp batter, or you’ll end up with lumps. I used my Fry Daddy for deep frying the shrimp (in batches of five) and it worked perfectly. Watch the shrimp carefully, they will turn from brown to burnt in a matter of seconds! Make sure you season the shrimp with salt when they come out of the oil – the extra salt really helps to balance out the sweetness of the coconut. well i would not stop after one, not with that sauce at least. Gosh, this looks so appetizing! And the mango!!! delicioso!!!! This recipe looks great! I can't wait to make it. I also just tweeted about it. I just tried this recipe and oh my!! so good. Thank you so much for your step by step recipe. The only con of making this recipe, is that you might finish everything by the time you are done. This looks amazing, of course! And I love your creativity so keep doing what you’re doing. I like to eat a lot of shrimp. Thank for sharing. Looks really yummy!